November 27, 2011 - On Saturday morning a single engine Cirrus SR20 airplane departed Marion Municipal Airport, Marion, Indiana with four people onboard. At about 10:25 AM, all four people were killed when the Cirrus SR20 aircraft crashed in a farm field near U.S. Route 14 and North Ridgefield Road near Crystal Lake Airport, McHenry County, Indiana. Crystal Lake is a city located in southeastern McHenry County in northeastern Illinois, in the Chicago suburbs. It is named after Crystal Lake, a lake located 1.6 miles west-southwest of downtown. Crystal Lake is also a suburb of the city of Chicago. Onboard were the pilot Ray Harris, his daughters Ramie and Shey, and one of the girls? boyfriends. Ramie was on her way back to Wheaton College after the Thanksgiving weekend. Harris was rated as a private pilot with airplane single engine land privileges. Cirrus SR20 aircraft tail number N223CD was manufactured in 2000 and owned by Marion Pilots Club, Marion, Indiana. The aircraft was a four seat piston engine composite monoplane that was flying under ?visual flight rules.? The SR20 is noted for being the first production general aviation aircraft equipped with a parachute designed to lower the aircraft safely to the ground after loss of control or structural failure. 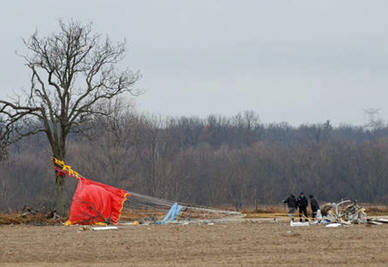 One of the plane's parachutes deployed and was hanging from a tree near the crash scene. A witness reported that the aircraft "disintegrated" and that the only thing really visible was a parachute that struck the tree line. It is unclear at this time what caused the fatal crash. However, the NTSB is combing over the wreckage for answers to this deadly crash. This is the second deadly aircraft tragedy over the Thanksgiving holiday in which a family and mother has had to come to terms with the loss of her children. On Wednesday a twin-engine Rockwell 690A aircraft crashed in the Superstition Mountains at Flat Iron killing a father and his three children along with three others when the aircraft traveling at about 200 mph slammed into the mountain ridge. Update- NTSB Report Out - On November 26, 2011, about 1025 central standard time, a Cirrus Design SR20, N223CD, impacted a tree and terrain near Crystal Lake, Illinois. The pilot and three passengers were fatally injured. The airplane was substantially damaged. The aircraft was registered to Marion Pilots Club and operated by the pilot under the provisions of 14 Code of Federal Regulations Part 91 as personal flight, which was not operated on a flight plan. Instrument meteorological conditions prevailed in the vicinity of the accident site. The flight originated from Marion Regional Airport (MZZ), Marion, Indiana about 0830. The intended destination was DuPage Airport (DPA), West Chicago, Illinois. At 0958, the pilot contacted DPA Air Traffic Control Tower (ATCT) and inquired about landing at DPA. The controller advised the pilot that the airport was under instrument flight rules. However, the flight inadvertently flew over the airport. The pilot reversed course in an attempt to return to the airport but lost sight of it. He subsequently informed the controller that he was not sure if he wanted to land at DPA because he did not want to "get in there and get stuck all day" due to the weather. The controller noted that Chicago Executive Airport (PWK), located about 20 miles northeast of DPA, was reporting visual flight rules (VFR) conditions. The pilot subsequently informed the controller that the flight was "in and out of the clouds right now." When the controller asked the pilot if he was instrument flight rules (IFR) qualified, the pilot replied that he was in "IFR training and I've let this get around me." About 1012, the flight was transferred to the Chicago Terminal Radar Approach Control (TRACON) facility. The Chicago TRACON controller also provided weather conditions at airports in the vicinity of the accident flight. The pilot initially advised the controller that he would proceed to PWK, which the closest airport reporting VFR weather conditions at the time. However, the pilot later advised the controller that he was no longer inbound to PWK. He commented that he didn't want to "mess with the weather" and didn't want to "get stuck in here." The controller subsequently approved a frequency change and the pilot acknowledged that transmission. No further communications were received from the accident flight. A witness located within 1/2 mile of the accident site reported hearing an airplane in the area; however, he was not able to see it because of the cloud cover. He noted that it sounded like the airplane was doing aerobatics, with the airplane climbing and descending. Less than 1 minute later, he observed the airplane south of his location in an approximate 70-degree nose down attitude. The airplane subsequently impacted the ground. He noted a faint fuel smell shortly after the accident when he responded to the site. It was misty, with a light rain at the time of the accident. The airplane impacted a tree and an open agricultural field about 4 miles north-northwest of Lake in the Hills Airport (3CK). Multiple tree limbs up to about 4 inches in diameter exhibiting fresh breaks were distributed over an approximate 45-foot by 45-foot area immediately north of the tree. The wreckage path was oriented on a bearing of approximately 009 degrees magnetic. The debris field was about 400 feet long by 75 feet wide originating at the tree bordering the field. The main wreckage came to rest approximately 97 feet north of the tree. The main wreckage consisted of the fuselage, right wing, and horizontal stabilizer. The remaining airframe components, including all control surfaces, were located within the debris field. The engine and propeller had separated from the airframe and were each located 155 feet and 131 feet north of the main wreckage, respectively. Weather conditions recorded at DPA, located about 22 miles south of the accident site, at 1029, included overcast clouds at 900 feet above ground level, 1-3/4 miles visibility in light rain and mist, and wind from 170 degrees at 11 knots. The pilot held a private pilot certificate with a single-engine land airplane rating issued on April 22, 2010. Federal Aviation Administration (FAA) records indicated that the pilot did not hold an instrument rating. He was issued a third-class airman medical certificate, with a restriction for corrective lenses, on June 28, 2011. Prior to the accident, the pilot had logged about 205 hours total flight time, with approximately 114 hours flight time in the accident airplane. The accident flight was approximately 2 hours in duration. The pilot's logbook included a high performance airplane endorsement. The accident airplane was a Cirrus Design model SR20, serial number 1110. The airplane was powered by a 210-horsepower Continental Motors IO-360-ES six-cylinder, reciprocating engine, serial number 827771-R. At the time of the accident, the airplane had accumulated about 1,758 hours total time in-service. The engine was installed on the airframe in December 2008 and had accumulated about 459 hours since new. According to the airplane maintenance records, the most recent annual inspection was completed on April 5, 2011.